Clouds race across the sky above Boha savanna as we trudge beneath. 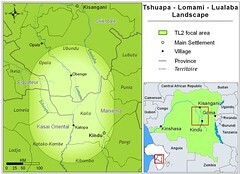 The Lomami flows northward from sources far south of the equator. The tributary rivers on the two sides of the Lomami run different colors. The right-bank rivers, those draining the east, run clear, but dark with tannins. Tea color. Filtered clean by white sands. The left bank tributaries run turbid brown with sediments carried from the decaying red and ochre lateritic soils. Here, on the west bank, are areas of higher fertility; there are leaf-eating okapi, red colobus and the new species of monkey, Lesula. All are absent on east side of the central Lomami River. The east bank forests are a patchwork. Although towering forests follow rivers or appear on the upland along small streams, and although shorter dark groves of pure “mbau” cover entire hectares within more rambling mixed forests, this varied forest cover is rent as though a chemical burn ran up through the trees leaving broad carpets of savanna surrounded by short, tough-leaved dwarf forest like scar tissue along the edge of a wound. 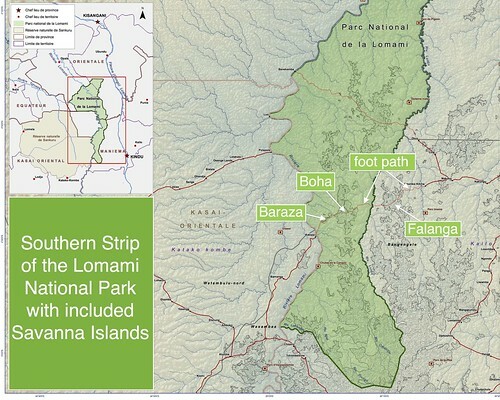 The whole southern tongue of the future Lomami National Park is flayed by savanna striations. We cross three savannas on the 37km trek between Chombe Kilima and Katopa camp. In March, as we approached the edge of Boha savanna I could feel the fingers of heat reaching into the shade from what seemed to be a petrified explosion of white light where the trees ended. It was just past noon. I lay down on the cool leaf duff and said “I’m resting ‘til the sun starts down.” We did not enter the savanna until after 3:00 PM, but still, with the first steps I felt the sun’s hand fall like 40 lbs extra weight …not until 5 :30 PM as the sun sunk into the next and last savanna could I look up without a grimace of pain. We arrived on the edge of the Lomami River after dark. Rain above and the remnants of the sun still color the savanna. In April, again on the path to Katopa camp, there was cloud cover the whole way and I skipped across Boha (well not quite), appreciating all that was practically invisible under the sun glare of the previous trip: Flowers, moss, the round rise and fall and the beckoning forest contour. Miniature orchid in the sand. What is the origin of these savannas? We don’t know. They are in the forest belt. We suspect they are remnants of an inner lake, from when the Lomami and Lualaba once were one. This is geologic conjecture…not quite enough evidence. 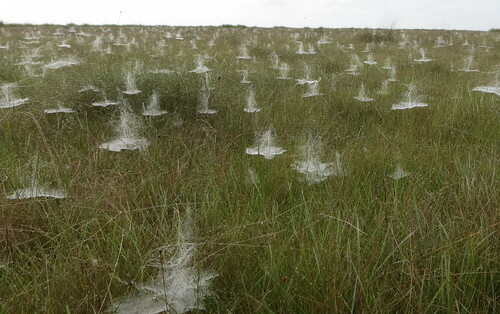 Whatever their origin – the savannas occur as open strips with white sand substrate and areas of fine black, clinging muck. The water table is high such that even the slightest dip sinks to swale. The savannas, like the forests that enclose them, are a patchwork. 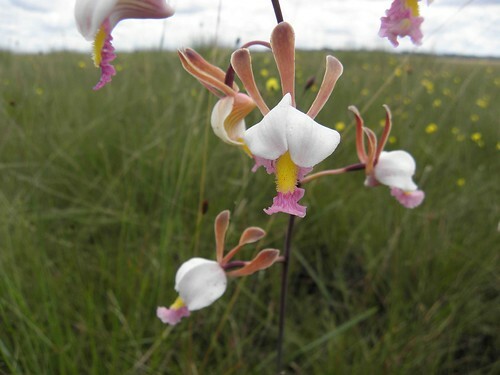 We walk first through the area of white and pink orchids, then of spiderworts, then of purple orchids and finally the terrain of black-headed bee eaters who make burrows up to 1.5 meters into the flat, featureless sands during the dry seasons. White and pink orchids with the forest still distant. 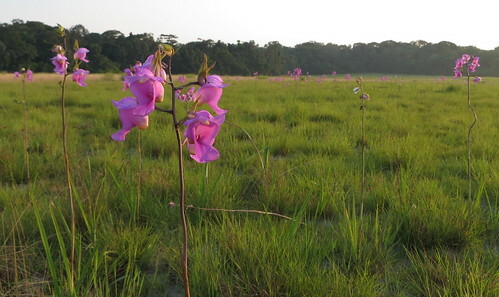 A field of purple orchids towards the end of Boha savanna. We, along with the path are swallowed by thick tall grasses in higher drier areas. 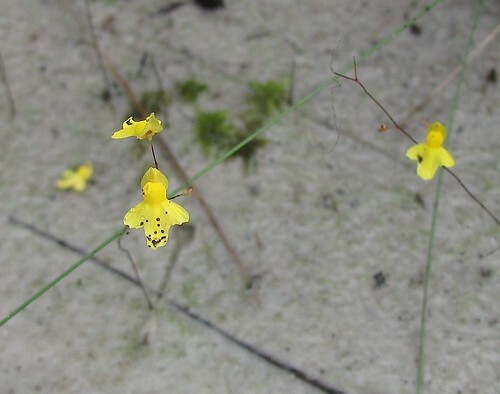 Elsewhere, vegetation is clumped; grasses are short, sparse and mixed with sedges, reeds and miniature flowers . There are patches of sphagnum moss and club moss. After heavy rains the savannas flood and paths become streams where small fish come up from somewhere to swim between our ankles. 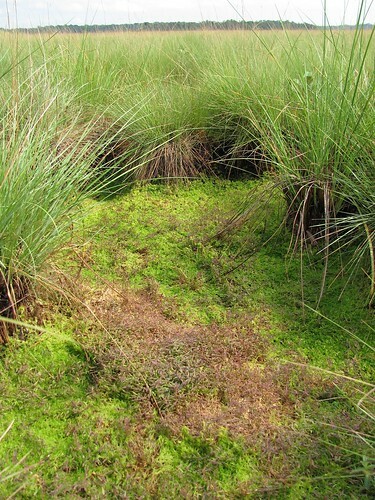 A mini-sphagnum bog tucked into the savanna. The savannas a century ago…. Certainly they were used by great herds of elephants, now gone. The elephants are a memory of the oldest villagers and their grandfathers told them of even grander herds remembered from their own childhoods. 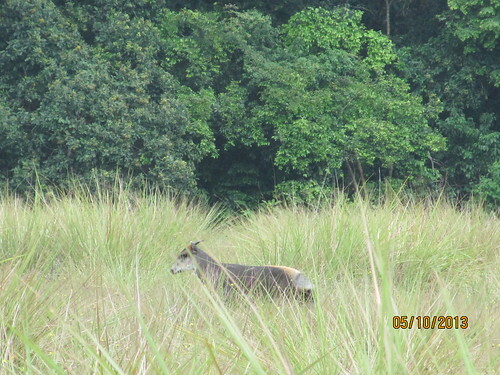 Yellow back duiker out on the savanna. 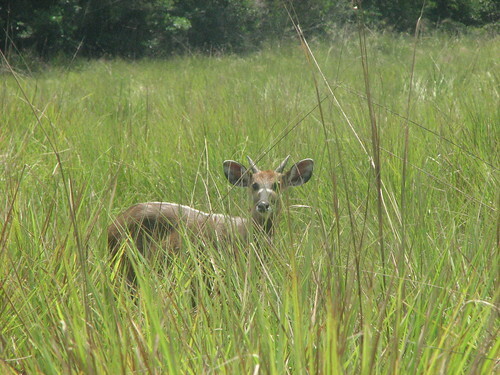 Sitatunga along the forest edge. We see sitatunga, red river hogs, yellow back duikers and sign of reedbuck, jackal, serval… Now that some of these savannas are protected and no longer burned during the dry season, perhaps they will change again. Watching a burn outside the park. We are covered from the sun and carrying water. Cobweb funnels all the way to Boha’s distant horizon. This entry was written by Terese Hart, posted on 2014-07-06 at 4:32 pm, filed under Elephant, Natural History of TL2, The Forest. Bookmark the permalink. Follow any comments here with the RSS feed for this post. Post a comment or leave a trackback: Trackback URL.